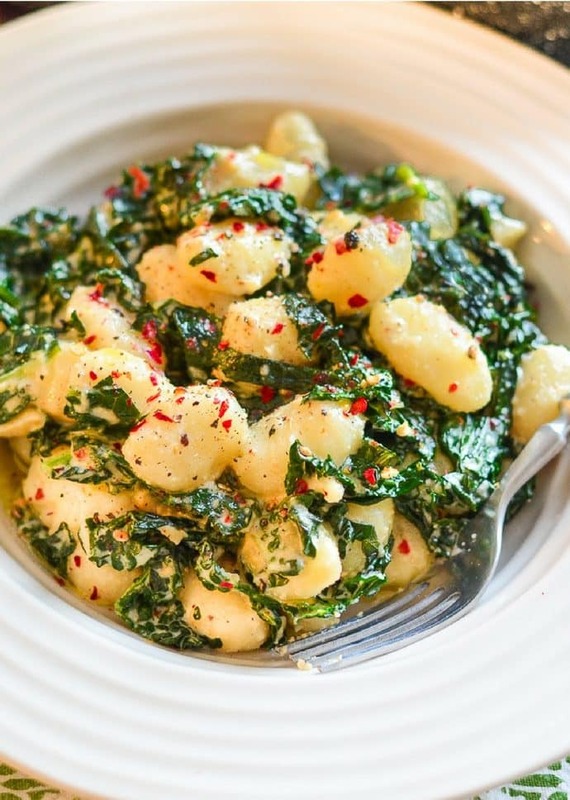 Soft fluffy pillows of gnocchi & tender, sautéed kale, tossed in a creamy, garlic infused sauce. 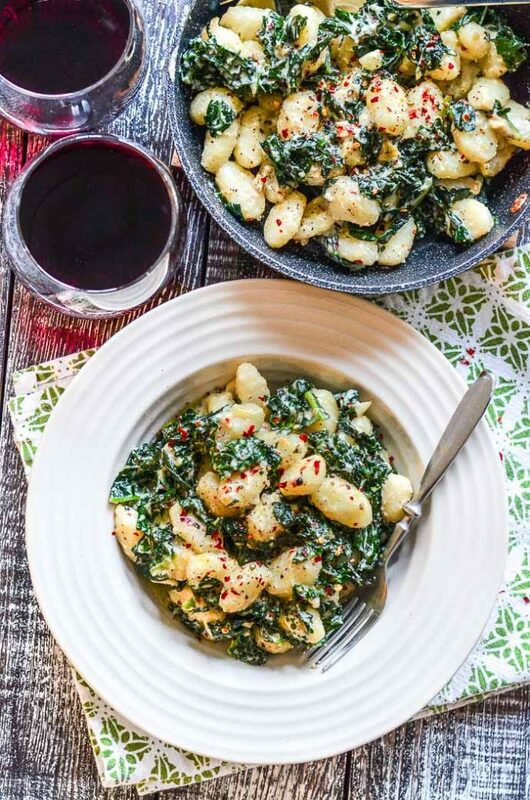 This Creamy Vegan Gnocchi with Garlic & Kale is dinner party worthy but incredibly easy to make, taking less than 15 minutes from start to finish and that includes prep time too! Ok. Compose yourselves. Are you ready for food heaven? Because it’s happening right here, right now. 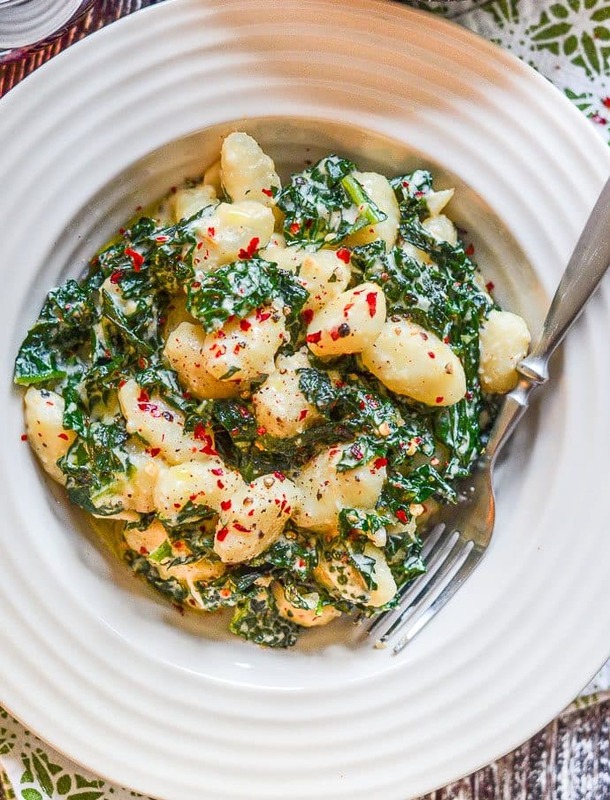 And as far as effort versus output goes, we are onto a winner with this Creamy Vegan Gnocchi with Garlic & Kale. It is out of this world delicious. 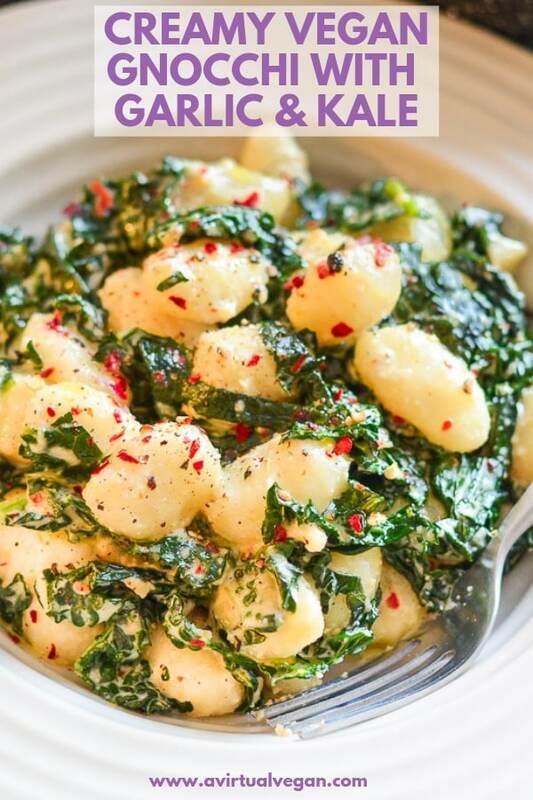 The fluffy little gnocchi pillows are smothered in a creamy, garlic infused sauce and tossed with sautéed kale. The flavours and textures work so well together. Bliss. THE only word to describe it. And what makes it even better is that it is ready in under 15 minutes and that includes prep time. Seriously, this dinner party worthy recipe is simple and easy enough to make mid-week after a long old day at work. You know those evenings when you just want to impress yourself? …. Or you can keep it in your back pocket for times when you are entertaining and want to impress everyone! Your call, but whichever way you cut it, I highly recommend serving it with a glass of red wine. The perfect combo! Sauté some garlic with bite sized pieces of kale. Blend the 2 sauce ingredients in a blender. If you don’t have a high powered blender then I recommend soaking the cashews in water first to get a really smooth result. I have a Blendtec blender like this one and it gets sauces silky smooth with no effort at all. Add the sauce, stir well and serve immediately. It’s rich, creamy and indulgent! If you don’t have gnocchi you can use pasta instead! It tastes like way more effort went into it than actually physically happened ???? Ok are you ready to be wowed? Go grab yourself some gnocchi and let’s do this! 1 x 500g package gnocchi , most are vegan but be sure to check the ingredients label just in case. Gluten-free varieties are also available. Again be sure to check labels. Everything happens pretty fast so be sure to have all of your ingredients and equipment ready and within easy reach. Remove the thick stems from the kale leaves. Discard the stems and chop the leafy parts into bite sized pieces. While the kale is cooking, blend the cashews with the ¼ teaspoon salt and water until completely smooth. After a couple of minutes, once the kale has been sautéing for about 3 minutes, add the gnocchi to the boiling water. Make sure to separate each piece of gnocchi before adding it to the water. Often they get a little clumped together in the pack. Have a slotted spoon ready to fish them out when done. 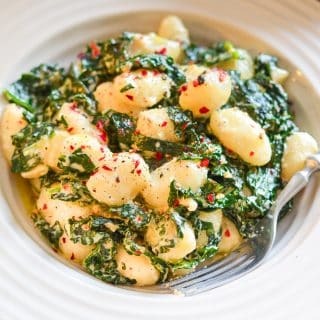 As soon as the gnocchi start to float (after about 1-2 minutes), use a slotted spoon to remove them (do not discard the water) and add the gnocchi into the pan with the kale and garlic. Spoon the creamy cashew sauce into the pan and stir to combine everything. Add a little of the water the gnocchi was cooking in to thin it out a little as needed and add more seasoning if desired. *For a nut-free option you can use shelled hemp seeds in place of the cashew nuts, or you can skip the cream sauce completely and use extra olive oil to coat the gnocchi and kale instead. It's really delicious if you use a good quality extra virgin olive oil. I like to sprinkle some extra chili pepper flakes and some freshly ground black pepper on top when serving. Some grated vegan parmesan is great with it too. Best eaten immediately. If you reheat it the gnocchi can get a little tough. If you do have leftovers warm them gently in the microwave or a pan, adding some water to thin the sauce as needed. Pasta makes a great alternative to the gnocchi in this recipe.